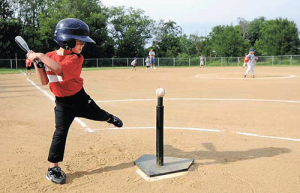 T-Ball is usually one of the first experiences children will have with the game of baseball or softball. It’s how they learn how to play and be part of a team. T-Ball fundraisers are important since they help offset the cost of uniforms, hats, equipment, and to maintain fields. Giving Bean is an easy and effective coffee fundraiser. With no start up costs, step by step instructions, online support, and fast shipping, Giving Bean is the perfect fundraiser for any t-ball team! People love our products because most use them daily. Freshly roasted coffee, unique artisan teas, and gourmet all natural cocoa and chai are hard to resist. There’s something for everyone and kids love our cooca! With the traditional paper order form fundraiser you will make 40% as well as 25% from online sales. Giving Bean’s online fundraising component is a great way to reach friends and family who wish to support your fundraiser but don’t live nearby. Participation is key for fundraisers. An easy way to meet your goal is to assign each member to sell a certain amount of products so you can easily reach the number you want. We also offer free customization of coffee labels which will look great with your team’s logo on them.